Deutsche Welle (DW) announced a competition earlier in the year, the DW Blogger Competition for environmentally-mined bloggers. The competition deadline has now been extended! Do you have ideas that will help the environment in Nigeria? Do you want to be recognized as being a digital hero for environmental issues in Nigeria? 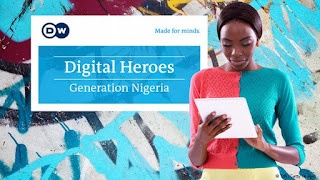 If your answer is yes, DW is excited to invite you to join its blogger contest “Digital Heroes – Generation Nigeria”. 2). What kind of work can you submit? "How to preserve the environment"
On the Digital Heroes entry form, you must include a link to the post on your social media platform. Submit this form before the deadline (see below). Please note that entries after the deadline will not be accepted. By participating you declare that you accept the official terms and conditions. Deutsche Welle ("German Wave" in German) or DW is Germany's public international broadcaster. The service is available in 30 languages. DW's satellite television service consists of channels in English, German, Spanish, and Arabic. DW is a member of the European Broadcasting Union (EBU). DW offers regularly updated articles on its online news website and runs its own center for international media development, DW Akademie. DW has been broadcasting since 1953. It is headquartered in Bonn, where its radio programmes are produced. Television broadcasts are produced almost entirely in Berlin. Both locations create content for DW's news website.